This tiny landlocked country with its ancient monasteries, misty mountains and vast steppe has as its capital the oldest continually inhabited city on earth. However, perhaps one of the most extraordinary things about Armenia is that it exists at all. It is bordered by Turkey, Iran, Georgia and Azerbaijan and the borders have been contested throughout its history. Today Mount Ararat, where Noah and his ark famously came to rest, lies over the border in Turkey, yet it nevertheless remains a potent symbol of Armenian identity. Indeed the capital, Yerevan, was designed so that the holy mountain could be seen from every corner in the city. Dubbed ‘the sunniest of the ex-Soviet capitals’ by Rough Guides, and ‘Armenia’s pink city’ by the Smithsonian magazine, Yerevan is built of a beautiful soft-hued pink volcanic tuff, which changes with the light and is at its most intense at sunrise and sunset. It is a stimulating cosmopolitan city, a wonderful place to simply walk around, with a vibrant cafe society and a sophisticated intellectual and cultural life. Chess is huge here — indeed Armenia is the first country in the world to make chess a compulsory school subject. Armenia was the first state in the world to adopt Christianity as its official religion — in 301AD, beating the Roman Empire by 12 years. Whatever your religion, its ancient churches and monasteries — many sited in beautiful breathtaking isolation — are awe-inspiring. Highlights include Echmiadzin, the 7th century seat of the Armenian Church, and the Zvartnots temple, partly destroyed by an earthquake in the 10th century, but retaining unforgettable traces of its magnficent stone carvings. Another amazing place is the Geghard Cave Monastery, carved into the natural rock. It is renowned for its acoustics, and we are lucky enough to have arranged a short private concert of early medieval Armenian music. 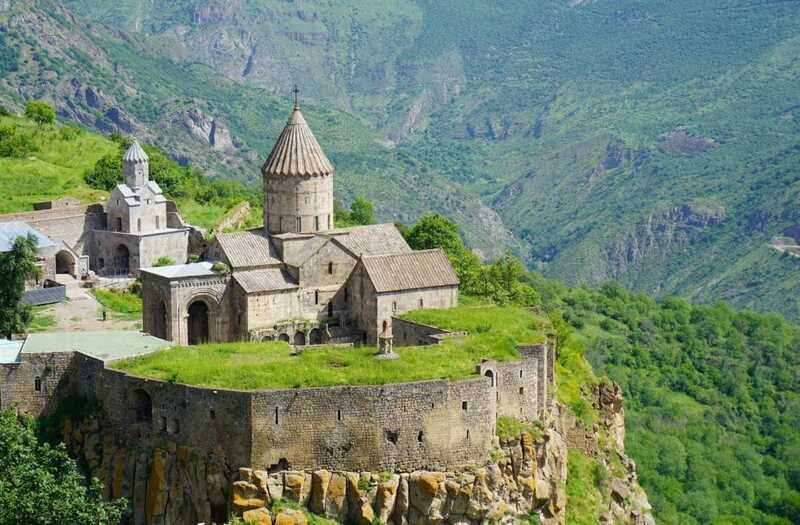 We will also visit the monastery of Tatev, sited high above a beetling canyon and reached by the longest cable car ride in the world. Lorded over by eagles, the vast Armenian steppe is at its most glorious in late spring, when carpeted with one of the world’s most fabulous grassland floras. Journeying across the steppe, passing only flocks of sheep, clusters of beehives (Armenian honey is justly famous), and the occasional bothy-like caravanserai, gives the sense of being in a landscape that has not changed for several millennia, and for many of our guests is one of the most intense experiences of the trip. So too is a visit to the Symphony of Stones, an extraordinary formation of lava-extrusions in the Garni gorge, close to Armenia’s best preserved Roman temple. And to let our guests get under the skin of the ‘real’ Armenia, we have organised a dinner in the house of a rural Armenian family, who will teach us how to make lavash the traditional unleavened bread, baked in underground ovens. Other typical foods include bulghur wheat, lamb and chicken,often accompanied with yogurt and lots of fresh wild herbs,and trout from Lake Savan, one of the highest freshwater lakes in the world! As for wine, Armenia has been making it for at least 6500 years (we visit an ancient winery as proof!) and it is also famous for its brandy, which we will sample at a wonderful distillery. Another unforgettable experience!